It was one of those mornings in the late fall, when the sky was so grey that you couldn’t tell whether it was daylight, or still dark outside. Halloween was over for another year, and the snow hadn’t begun for the season, to remind us that Christmas was coming. It was just one of those four or five dark, grey, lifeless weeks in between the colourful fall, and the bright snowy winter, when Mother Nature didn’t seem to know what to do. I headed downstairs that Saturday morning, and took a quick look at the clock on the kitchen wall. With the sky so overcast, I couldn’t even guess what time it was, and I didn’t have a clock in my bedroom upstairs. All I knew was the weekend was here, so I didn’t have to go back to Glen Tay School for another two days. The whole house seemed gloomy. When I got to the bottom of the stairs, and opened the door, the living room was empty. Where was everybody? The only room that seemed to be lit up in the old house was the kitchen, and as I walked through the living room, and got close enough to see, Mother was in full production, as usual. She had the old aluminum meat grinder attached to the kitchen table, and had bags of flour and sugar, and boxes of baking soda and baking powder lined up along the edge. There were packages of raisins and candied pineapple, and currants and cherries, all over the top of the freezer, as though they were waiting their turn to go into the huge white ceramic mixing bowl. It looked as though some kind of dried fruit was making its way through the meat grinder, and dropping into one of the melamine bowls waiting below. “Sure.”, I said, and picked up the three quarters that were already sitting there waiting for me, at the end of the table. I grabbed my blue corduroy jacket off of the hook, and headed outside. As soon as I opened the door the cold air hit me, and I remembered how the weather had been getting cooler and cooler these past weeks. It felt cold enough to snow, I thought to myself, and I picked up my old, red, battered bike, still lying on the same spot where I’d left it in the yard, the night before. Brrr. It felt even colder once I was on the bike and moving. The lane was downhill, and I coasted all the way onto the Third Line. I had a quick check for cars, and turned right, still coasting for a bit, then I began to pedal. Ugh, Heney’s dogs!, I thought. I needed a newer, faster bike, or a car, or a spaceship; something to get me past Heney’s faster. As soon as I saw Conboy’s house, I pedaled like mad. I should have eaten breakfast first, I thought. I could use some energy. I made it past Heney’s unscathed. They didn’t even come out barking that day. They must have been feeding them or something, I thought. Whew! That was easy. I was moving pretty fast, and made it to Cavanagh’s in no time. Helen was working, and she pointed out the molasses, and asked how everyone was doing, just like she always did. I paid for the molasses, and picked up my bike where I’d left it; propped up against the front entrance of the store. Since it was Saturday, I decided that I’d take the long way home. I just didn’t feel like riding past Heney’s again and was sure those dogs would be back out on the road, full of food now, and ready to chase me up the Third Line. I crossed the road and headed up Cameron’s side road. I passed S.S.# 4 school, and was heading up toward Calvin Church. This part of the trip was a bit harder, as it was uphill all the way. I passed the church, then up the road a bit more, and turned right onto the Fourth Line. It wasn’t long until I was down near Calvin and Marion Jordan’s place, and I slowed down a bit, as I rounded the corner, and headed toward the railroad tracks. I glanced down into the ditches and spots where I could usually find some flowers to bring home for Mother, but there was no colour in the ditches that day, and even the cattails had gone to seed in the swamp and looked dirty,white and furry. I didn’t see anything worth bringing home for a bouquet. When I finally arrived back in the yard, I threw down my bike, and walked into the kitchen. I could smell the cake batter as soon as I opened the door. The batter for the Christmas Cake was pinkish. I’m not sure why it was that colour; maybe it was juice from the cherries. Mother had saved the bowl for me to clean, and it was sitting on the edge of the table. Mother said she would add the molasses in with the ground fruit, and that sure worked for me. I loved cleaning out the cake batter bowls. This was my kind of breakfast! I’m not sure why the Christmas Cake had to be made so early. Mother said it had to ‘ripen’ and I was never really sure what she meant by that. It wasn’t like a green banana, or one of the green apples from back in the orchard. Still, it was part of the process of making the cake each year, and there was no point in arguing. No matter what the reason for making the Christmas Cake in what seemed like the drabbest, dreariest part of the year, I liked to think of it as kind of a light at the end of a tunnel. It was so grey and colourless outside. The bright leaves were lying, lifeless on the ground. The birds had left the yard. I couldn’t find one bright, pretty flower to bring Mother for a bouquet; not even a cattail. Nature seemed to be in limbo; not sure what to do next. Making the Christmas cake was the first sign that the brightest season of the year was on its way. In just a matter of weeks we’d be celebrating Christmas. Bit by bit, in the days ahead, we’d be making progress on our preparations. The Christmas cards would be signed and addressed. Betty Miller and Frances Dixon would begin organizing the Christmas concert at Calvin Church, and we’d all have our parts to study, and new songs to learn. Dad would be stringing the Christmas lights on the big spruce tree near the house, any day now. Soon, we would be strolling back into the bush to size up the possible candidates for the Christmas tree, that would grace the corner of our living room. Before too long, pans of fudge would be prepared, and all sorts of cookies and squares would be baked and stored. Crepe paper streamers would be brought out of storage, and old decorations glued and repaired. So the grey days, I concluded to myself, were days of preparation. These were the days when we would have time to spend getting ready for Christmas. They were the days when we wouldn’t be distracted by the bright sun, and green grass, to go outside and play, but would stay indoors, and stroke things off of our to-do lists. In its wisdom, Nature had given us quiet, thoughtful days like these,to focus on the things to come, because Christmas would be upon us in no time at all. Dorothy Woolsey, born in Lincolnshire, England was just sixteen years old when her mother Mary-Jane Foster Woolsey, passed away. She often told the story of how they dyed her favourite red coat – black for her mother’s funeral. In 1909 her father William Woolsey brought Dorothy and her siblings over to Canada, because his eldest daughter had weak lungs, and the doctor told him the air in Canada would be better for her. They settled first in Winnipeg, and Dorothy’s older sister Florence married and moved to Saskatoon. Dorothy went to visit, and she met a handsome young man named Charles Rutherford, a Mechanical Engineer, who came to Canada from St. Lawrence County, New York, to seek his fortune. Dorothy and Charles fell in love, married and settled in Edmonton, where their children Dorothea ‘Dolly’, Mildred ‘Mill’, Audry, Muriel, and Jack were born. Mother, age 18, and her mother, Dorothy Woolsey Rutherford, in front of their home in Edmonton in 1936. 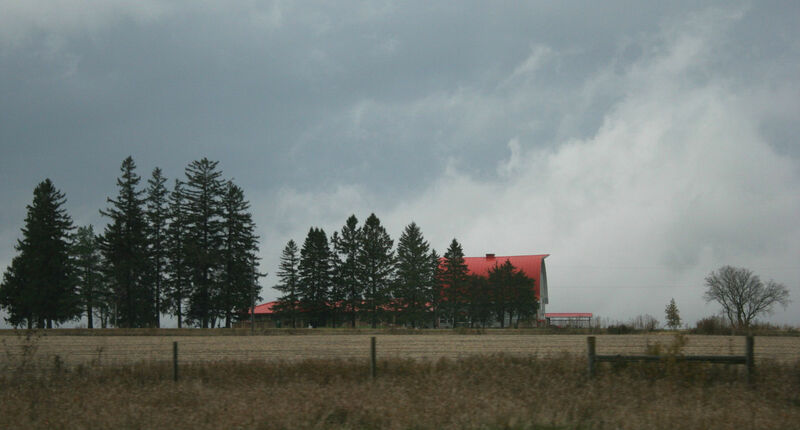 This entry was posted in Short Stories and tagged Arlene Stafford-Wilson, farm, lanark county, Perth, rural, rural Lanark County, Tay Valley Township. A very nice remembrance, Arlene. It seems to be that time of year. Lots of rain, some grey days and a glimmer of sun now and then. It’s the perfect time of year to do our ‘inside’ projects that we’d all like to cross off of our lists. A beautiful story and a very evocative photograph! Thanks Kenn – It was so nice chatting with you last month at the Crystal Palace. We had a very grey kind of melancholy sky that day as well. Thanks Shirley. I’m glad that some of the stories strike a chord with you. I think many of us had similar childhood experiences in the rural communities where we grew up. I think it’s important to preserve the memories for future generations so they will discover how we lived. Thanks!